Can you recall a cover image from a favorite book that you read as a child? 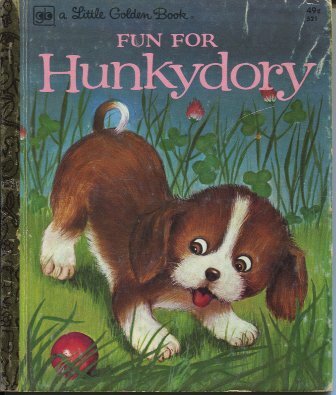 One of my favorite children’s books was a Little Golden Book titled, “Fun For Hunkydory.” After all these years, I can’t forget the book’s cover image of a cute little puppy playing in the grass. And, consider the popularity amongst adults of the new social network site, Pinterest. Talk about images galore! Without doubt, pictures and images within books and media for children and adults convey meaning and can make lasting impressions on readers and users. But, what about blog posts? Why should a blog author include images inside a post? Visual Learning – Many individuals who read blog posts are visual learners. The visual learning Wikipedia entry cites an Institute for the Advancement of Research in Education study titled, “Graphic Organizers: A Review of Scientifically Based Research,” which concluded that “visual learning improves student performance in the areas of retention, comprehension and organization.” If you’re trying to convey a concept within a blog post, including a relevant image will likely help you be more effective in that effort. Also, including images within your longer posts may help keep readers interested in reading the entire post. When it comes to visual learning and SEO, blog images are anything but.